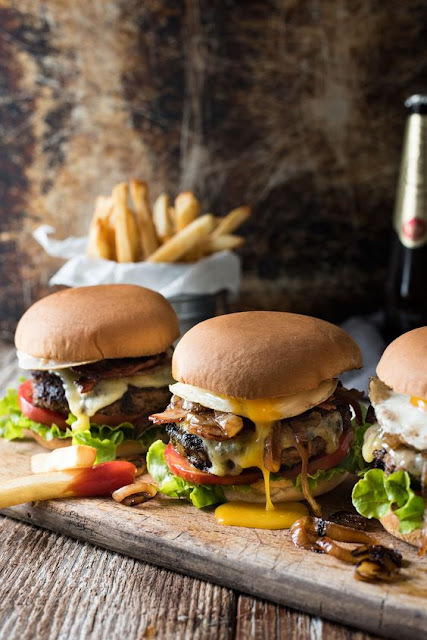 In my youth, I learned how to make hamburgers from a celebrity chef who insisted that you needed breadcrumbs, egg and seasonings for a truly great burger. And that’s how I made it for years, thinking that was the right way. Separate beef into 4 equal portions. Use hands to lightly form into patties the size of your buns (mine are about 10 cm / 4") - don't press hard, light fingers = soft juicy patties (see video for how I do this). Season generously with salt and pepper on both sides. Make a dent on one side (stop burger from become dome shape and shrinking when cooking). Heat 1 tbsp oil in a heavy based skillet or BBQ over high heat. Add onion and cook until wilted and caramelised. Season with salt and pepper, then remove. Heat 1 tbsp oil until smoking. Add patties and cook for 2 minutes until deep golden with a great crust. Do not press! Flip carefully, cook for 1 minute then top with cheese (if using). Cover with lid and cook for further 1 minute until cheese is melted. Meanwhile, toast the cut side of the buns lightly. Fat is where the flavour is, so use a 20%+ fat beef mince (ground beef, preferably chuck). 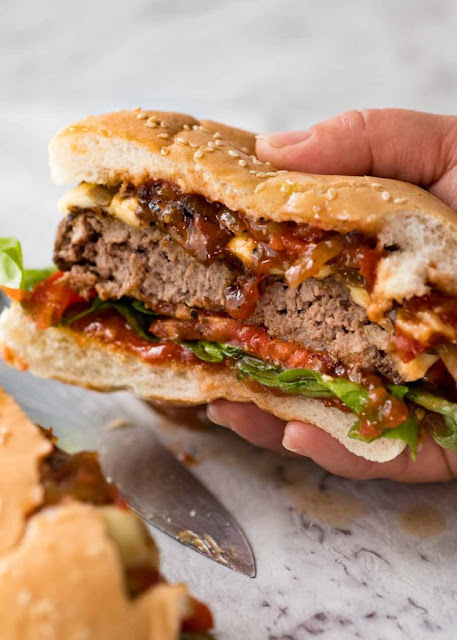 In Australia, even supermarket 20% fat beef mince is terrific, though quality beef from butchers (especially wagyu) will make exceptional hamburgers. To make this using lean mince, use this recipe which has flavourings added to compensate for less fat which provides flavour in this recipe. This is the original recipe I shared on the basis of making hamburgers using lower fat beef. 2. In the video, I use a store bought tomato relish. 3. Nutrition including: 200g/7oz hamburger patties, 1 slice cheese, 2 tbsp tomato relish, lettuce, tomato, hamburger buns. It is about 40 calories higher than actual as it does not take into account fat discarded from pan.